An original letter of correspondence between Joshua Coffin Chase and Isleworth Packing House Superintendent Corbett Hutchinson. Topics discussed in the letter include instructions for Hutchinson's business trip to New York City, New York and Washington D.C. to inspect and grade citrus fruit. Original letter from Joshua Coffin Chase to Corbett Hutchinson, April 26, 1928: box 49, folder 20.91, Chase Collection (MS 14), Special and Area Studies Collections, George A. Smathers Libraries, University of Florida, Gainesville, Florida. 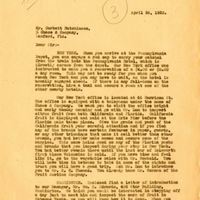 Digital reproduction of original letter from Joshua Coffin Chase to Corbett Hutchinson, April 26, 1928. NEW YORK. When you arrive at the Pennsylvania Depot, you can engage a red cap to carry your satchel from the train into the Pennsylvania Hotel, which is directly across from the depot. Our New York office was instructed to make you a reservation of a $4.00 or $5.00 a day room. This may not be ready for you when you reach New York and you may have to wait, as the hotel is usually engaged ahead. If there is any fall-down on the reservation, hire a taxi and secure a room at one of the other nearby hotels. Our New York office is located at 66 Harrison St. The office is equipped with a telephone under the name of Chase & Company. We want you to visit the office bright and early Monday morning and go with Mr. Lum to inspect citrus fruit from both California and Florida. California fruit is displayed and sold at the Erie Pier before the Florida sale takes place. Give the grade and pack of the California fruit your careful attention and if you find any of the brands have certain features in paper, guards, or any other trimmings that make memos and secure some of the samples. This same holds good on any of the Florida packs and brands that you inspect during your stay in New York. You had better remain there until the last car of Isleworth first bloom Valencias is sold. If you have time and feel like it, go to the vegetable sales with Mr. Newbold. You will have time in between to take in some of the sights and trust you will have a good trip. Ask Mr. Lum to introduce you to Mr. R. H. Thomas. You already know Mr. Gorman of the Fruit Auction Company. WASHINGTON. Enclosed find a letter of introduction to our Manager, Mr. Wm. E. Edwards, 408 Star Building, Washington. We think you would be interested in stopping off a day just to meet him and inspect the cars of fruit in Potomac Yards, so you will know how it is done. When you return to Florida we want you to write up a report and call to our attention any pointers that you think we can use next session. California; Chase and Company; Chase, Joshua Coffin; citrus; citrus industry; Edwards, William E.; Erie Pier; food inspection; Fruit Auction Company; fruit grading; fruit inspection; Gorman; grading; Harrison Street; Hutchinson, Corbett; inspection; Isleworth Grove; Lum, Frank P.; New York City, New York; Newbold, L. M.; orange; orange industry; packing; packing industry; Penn Station; Pennsylvania Hotel; Pennsylvania Station; Potomac Yards; processing; retail; sale; Star Building; Thomas, R. H.; Thomas, R.H.; Valencia orange; Washington, D.C.
Chase, Joshua Coffin. 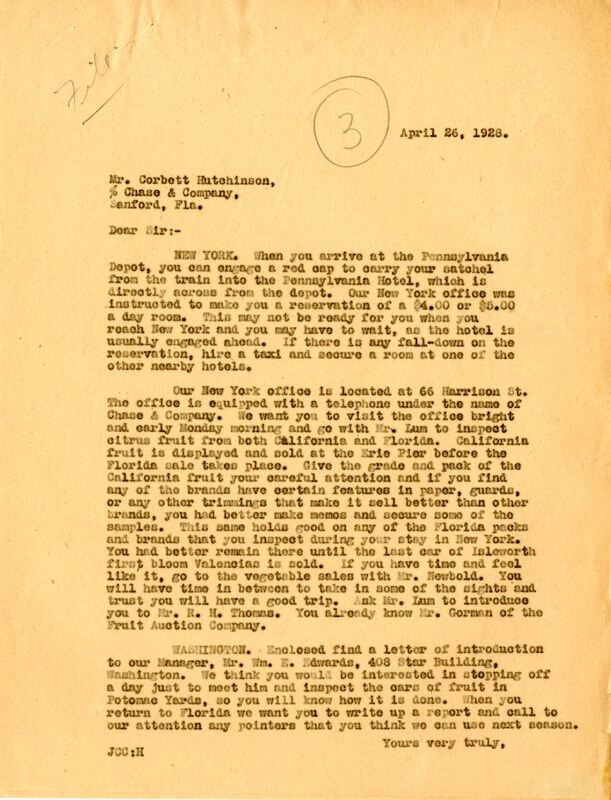 “Letter from Joshua Coffin Chase to Corbett Hutchinson (April 26, 1928).” RICHES of Central Florida accessed April 26, 2019, https://richesmi.cah.ucf.edu/omeka/items/show/2772.